Horizon Nuclear Power, a subsidiary of the Japanese conglomerate Hitachi, announced on last week it was halting construction of two new nuclear reactors at Wylfa Newydd in Wales. Sputnik spoke to Dr. Jonathan Cobb, a senior analyst with the World Nuclear Association, about the future of nuclear energy. Hitachi took a 300 billion yen (£2.1 billion) "extraordinary loss" on Thursday, 16 January, when it decided to shelve plans for a new nuclear power station on Anglesey, after negotiations with the British government over the funding of the £13 billion project broke down. The construction of the two nuclear reactors would have provided jobs for 9,000 workers. Duncan Hawthorne, CEO of Horizon Nuclear Power, said all work related to a second site at Oldbury-on-Severn in Gloucestershire would be suspended "until a solution can be found." ​In November another Japanese company, Toshiba, shut down its NuGen subsidiary and scrapped plans for a nuclear plant at Moorside in Cumbria because the numbers did not add up. Sara Medi Jones, acting secretary general of the Campaign For Nuclear Disarmament, said the decision to shelve Wylfa Newydd was good news because it "opens the door to investment in the renewable technologies of the future, and to leave behind dirty and dangerous nuclear power." But Dr. Jonathan Cobb, senior analyst with the World Nuclear Association, said this was simply not the case and he said the future of energy would actually be a combination of nuclear power and renewables. "The nuclear industry has put forward a target that 25 percent of the world's electricity will be provided by nuclear by 2050. Currently it's 10 percent. The other 75 percent has got to come from low-carbon energy, mainly renewables but possibly also carbon capture if that is possible," Dr. Cobb told Sputnik in an exclusive interview at the WNA's London office. "When our generation was growing up the number one concern was nuclear war and many people associated that with nuclear energy. It was the greatest fear in the 1980s. We expected the world to end and thankfully that has been something which has become less of an issue. Nowadays climate change has taken over as being the biggest threat to the world, so younger people are probably more open to all the options when steering away from fossil fuels," Dr. Cobb told Sputnik. But what about the safety issue? Dr. Cobb trots out some surprising facts about the world's worst nuclear accidents. "At Three Mile Island (nuclear power station in Pennsylvania in 1979) there was a partial meltdown but no health impact at all. At Chernobyl (in the former Soviet Union in 1986) there was a large explosion. There were 30 deaths immediately or in the aftermath and there have been 15 fatal cases of thyroid cancer in the area since. At Fukushima (hit by a tsunami in 2011) the whole area was evacuated and thousands of people had their lives disrupted but there were no direct fatalities," Dr. Cobb told Sputnik. "There has been nothing else on the scale of Fukushima or Chernobyl associated with the industry so when you look at the amount of electricity provided and the safety of the nuclear industry, nuclear has a very good safety record especially compared with hydro-electricity and fossil fuels," Dr. Cobb told Sputnik. The death toll in the coal mining industry runs into the hundreds of thousands, not to mention deaths from pneumoconiosis and the millions of civilian deaths caused by air pollution created by fossil fuels. The United States is the world's largest provider of nuclear energy and France is second, way ahead of Britain. "Between 75 percent and 80 percent of France's electricity comes from nuclear, which compares with 21 percent in Britain. France invested heavily in nuclear in the 1970s. It was triggered by the oil crisis. They went from nothing up to 80 percent in 15 or 20 years, whereas Britain had North Sea gas and plenty of coal at the time," Dr. Cobb told Sputnik. The bleak picture in Britain can be misleading, because globally nuclear power remains popular. China is investing heavily in nuclear, largely to replace its heavily polluting coal-fuelled power station, and four countries are about to build their first nuclear reactors — Bangladesh, Belarus, Turkey and the United Arab Emirates. With the exception of the UAE — who have relied on South Korean expertise — the other three are all partnerships with Russia's Rosatom, who are one of the biggest suppliers of nuclear knowhow in the world. Egypt has also identified a site for its first nuclear power station, which will again be built with help from Rosatom. Global production of nuclear energy recently hit 400 gigawatts — the highest its ever been. Last year 10 gigawatts were added to that capacity and another 15 is expected to be added this year, with 55 nuclear reactors under construction worldwide. But why is the UK lagging behind? Britain was in the forefront of nuclear energy back in the 1950s. The Magnox reactor at Calder Hall in Cumbria opened in 1956 and was one of the world's first. Ironically one of the last Magnox reactors to close was at Wylfa — close to where Hitachi has abandoned its new nuclear power station. Nowadays most nuclear reactors are Pressurised Water Reactors (PWRs) or their close cousins, Boiling Water Reactors (BWRs), but in Britain there are also a number of Advanced Gas-cooled Reactors (AGRs). Hinkley C — the only nuclear power station currently under construction in Britain — will be a PWR, while Wylfa Newydd would have been a BWR. "While many were built with approval to operate for 40 years, many are now applying to operate for 60 or 80 years. This would be dependent on regulatory approval," Dr. Cobb told Sputnik. Is Britain Sleepwalking into an Energy Crisis? There have been warnings about Britain sleepwalking into an energy crisis if more new nuclear power stations are not built soon to replace those, like Sizewell B, which are due to be decommissioned by 2035. "New nuclear is of significant strategic importance for the country. The government must not sleepwalk into an energy security crisis by allowing these projects to fail one by one," said Sue Ferns, senior deputy general secretary of the union Prospect last week. Dr. Cobb said Hinkley C — which will provide seven percent of all Britain's electricity — would probably be up and running by 2025 and he said many of the existing nuclear reactors could be kept running for longer without safety issues. ​So if the technology is not the problem, why did Hitachi and Toshiba pull the plug? Dr. Cobb said both were "disappointing" but he said the problem was money. "There was a change of policy in the mid-2000s. A review took place and the government looked at the supply and decided there needed to be more nuclear power. There has been government support in principle but the problem has been finding the financial model for it to take place," Dr. Cobb told Sputnik. Hinkley Point C pre-construction works, May 2015. He said "He said that one of the cheapest ways proposed for financing the new generation nuclear power stations was for the government to have raised the money through bonds. But they did not do that and instead asked the companies building the power stations to raise the money on the open market, which has proved immensely difficult even with the British government underwriting those loans. With the government distracted by Brexit, it has been unable to come up with the incentives to persuade Toshiba or Hitachi to carry on. 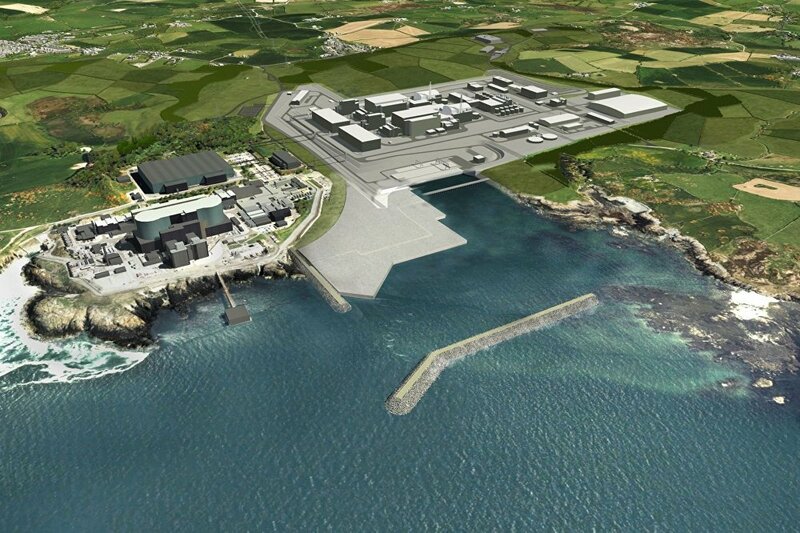 Dr. Cobb is hopeful Wylfa Newydd will happen one day, once the funding is sorted out. Globally he is confident about nuclear's future as part of a "low-carbon mix" providing the world's energy. "The world's population is still growing and there are more than a billion people who still have next to no electricity and if we are going to reduce greenhouse emissions then we need to go non-carbon. Nuclear can reduce emissions to zero. France has very low emissions, Finland is the same, Sweden — which relies on a mix of nuclear and hydro — is the same, and so is Ontario (in Canada) which relies on nuclear and hydro," Dr. Cobb told Sputnik.